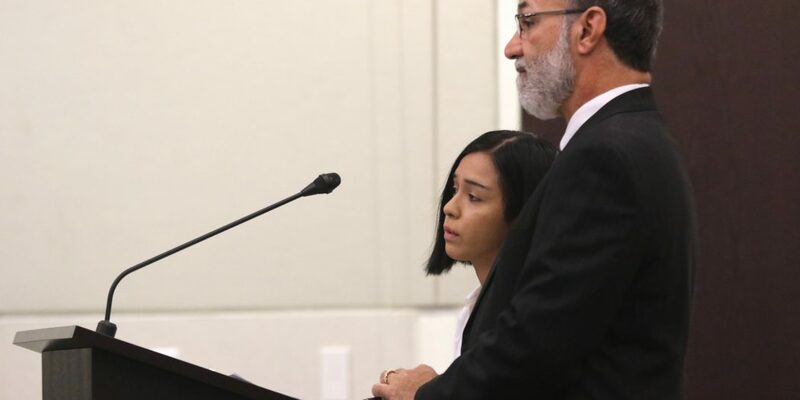 Damaris Guerrero-Garcia’s troubles began, according to court testimony, years before she fatally struck a University of Florida student with her car on a Saturday night in February. 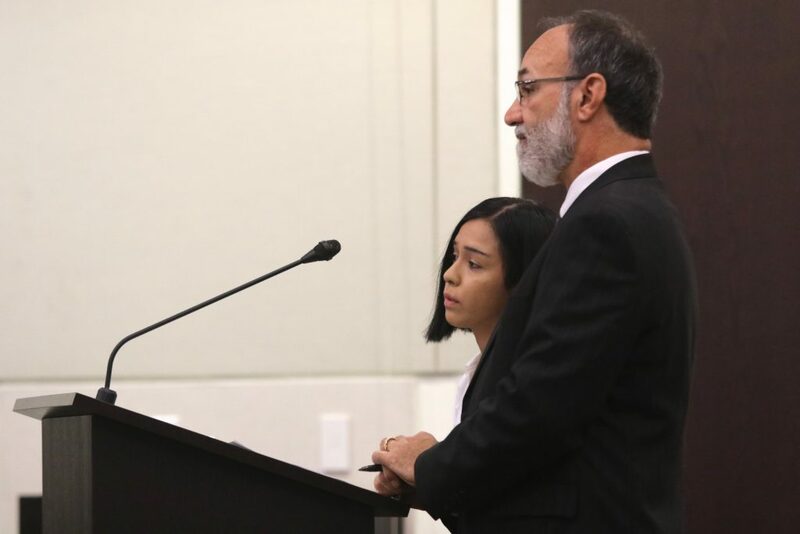 In a hearing on Tuesday at the Alachua County Criminal Justice Center in which the 23-year-old Marine Corps veteran pled guilty and was sentenced to seven years in prison, her psychological evaluators testified that years of abuse led to a “severe” drinking problem and a series of psychological disorders. She was honorably discharged as a Marine sergeant a year ago and, until February, had never had so much as a traffic ticket. Still, Circuit Judge James Colaw sentenced her to a prison term and eight years of drug probation for the second-degree felony charge of DUI manslaughter, as well as an additional two years of drug probation for the charge of leaving the scene of an accident involving serious bodily injury. The court also permanently revoked her driver’s license. On the night of Feb. 11, Gainesville police say Guerrero-Garcia missed a curve while driving her white Hyundai Sonata, drove over a curb, onto a sidewalk and hit three people at an RTS bus stop outside a complex then known as Campus Club Apartments, 4000 SW 37 Blvd. One person, Karan Khullar, suffered blunt traumatic head injury and chest injuries. He was pronounced dead that night at UF Health Shands Hospital. Investigators say Guerrero-Garcia stopped after the collision but did not get out of her car, instead driving on to a friend’s house. The friend, Kimberly Payne, has described her as looking and sounding that night like “there was nobody home.” She sped off from Payne’s house, attempting to drive to her home in Ocala via I-75, where Florida Highway Patrol troopers pulled her over in the Sonata. The car had caught on fire from the rim’s sparks. Breath tests revealed a .147 blood-alcohol content, nearly double the legal limit, and she subsequently spent 46 days in jail. 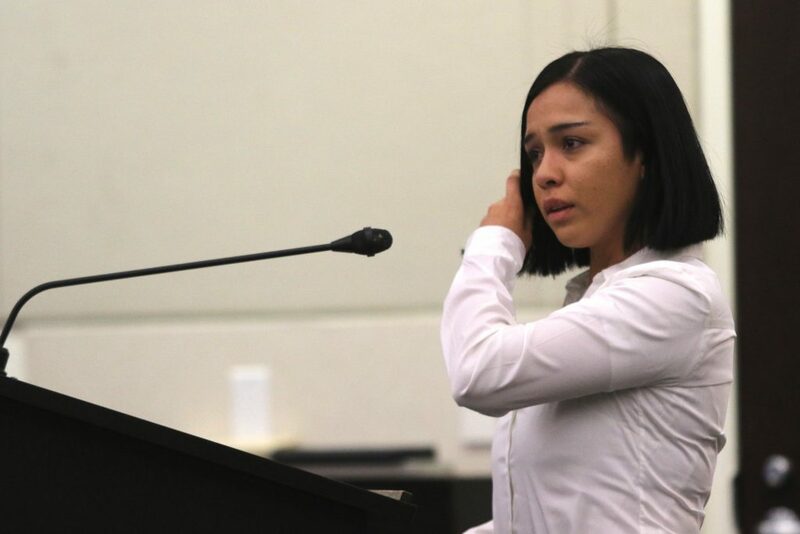 Guerrero-Garcia’s problems started, she told her psychological evaluators, with an abusive father. It’s not clear if the man was an alcoholic, her attorney said Tuesday, but he would frequently rage at his children. He died when she was 15. Then, she started drinking. In a clinical interview with licensed clinical psychologist Dr. Jennifer Sager that was submitted to the court, her school troubles started in second grade, when she became the target of bullying. She started skipping school and developed anorexia. She was sexually assaulted twice in high school and again after joining the Marine Corps, events that Sager said have led her to suffer from bipolar disorder, post-traumatic stress disorder, alcohol abuse and an eating disorder. The relevance of the assaults, Sager said Tuesday, was that the trauma causes a person to “disassociate” from reality. Guerrero-Garcia told Sager she still suffers guilt for not stopping to help Khullar because she “didn’t know” she hit him. That’s a sign, Sager testified, that she was deep in a manic depressive episode that night in February and would explain what Kimberly Payne saw in her dazed and intoxicated friend that night. Guerrero-Garcia had attained the rank of sergeant, at one point supplying 250 Marines and overseeing six soldiers. She told Sager her career was “amazing.” She was honorably discharged in August 2016 after earning three service medals and decided to move to north Florida to work on a nursing degree. Her dream, now dashed: become a commissioned officer as a nurse back in the Marine Corps. “She has damaged and tarnished that reputation,” her attorney Craig DeThomasis said. Her downward spiral started about two weeks before Khullar was killed. She stopped taking medication that had been prescribed by a VA doctor when she left the Marines. The night before, according to Sager’s clinical interview, she drank alcohol until 3 a.m., continuing a daily excessive drinking tendency that she developed in January. In India, one of the eldest child’s roles is to provide for his family. That was the message from Karan Khullar’s cousin, Anshul Sharma, who had encouraged Khullar to come to the United States to pursue a master’s degree in information technology at the University of Florida. “Karan used to tell his family that I want to learn something, I want to go back to India, I want to serve my family — my parents — because I’m the eldest son in my family. I have to take care of my younger brother and guide him,” Sharma said. Nicholas May from the state attorney’s office read a statement that Khullar’s father, Sunil Khullar, wrote. When it was her time to speak, Damaris Guerrero-Garcia turned to a half-dozen of Khullar’s friends and family. 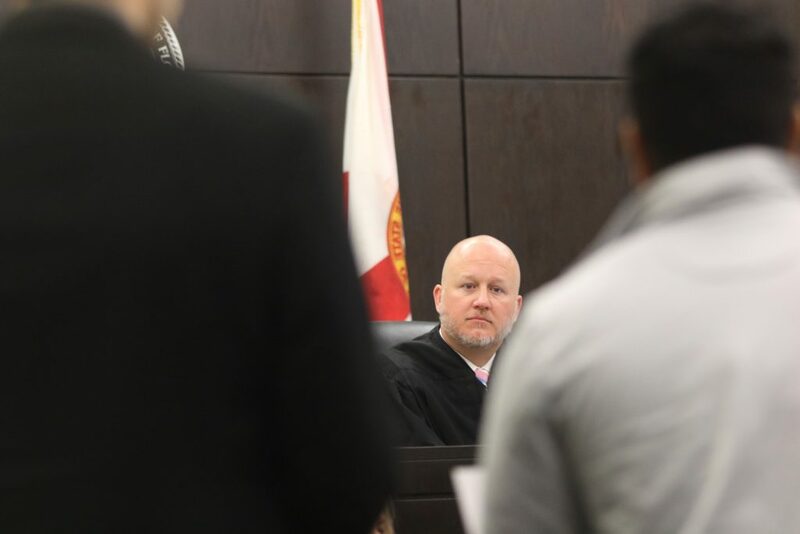 Since bonding out of jail earlier this year, her attorney said she moved from Ocala to Gainesville to be closer to legal counsel, to the Veterans Affairs Hospital, to complete treatment in a substance abuse program and, by all indications, to follow a path to sobriety. 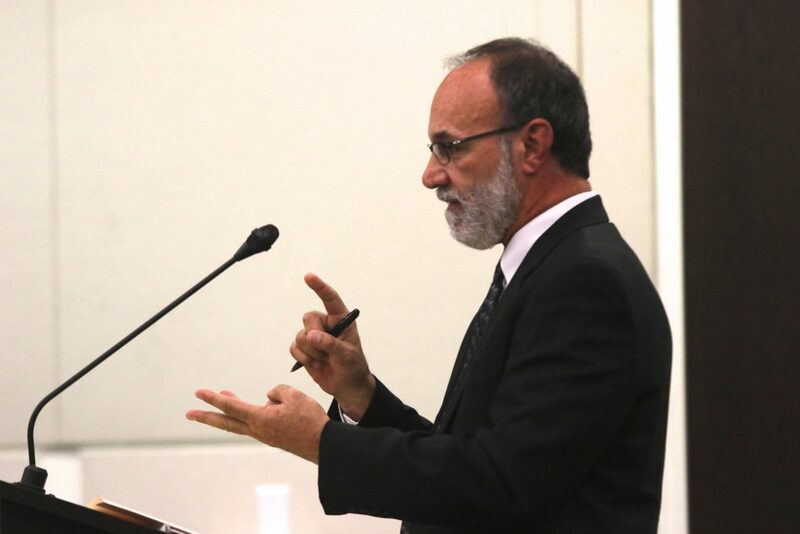 Because it was her first run-in with the law, because of her military service, because of the “unsophisticated” nature of the crime, and because of her early successful drug rehabilitation treatment, Craig DeThomasis asked Judge Colaw for leniency in his client’s sentence — perhaps near the mandatory minimum of four years in prison. Assistant state attorney Marc Peterson asked that Colaw order a prison sentence of 15 years. Colaw, after a 10-minute recess, announced the judgment and seven-year sentence, along with a restitution hearing for Nov. 27.